You have added Lotus Embroidered Open Back Maxi Dress in Coral Red into shopping cart. This gorgeous embroidered maxi has a unique combination of bold lotus flower embroidery designs for an effortless boho look! The Lotus Embroidered Open Back Maxi Dress is fully lined to the mid-thigh, and the attached skirt is made of semi-sheer flowy chiffon fabric. It has adjustable shoulder straps to control the fit of the dress. Raw edged fabric peeks out at the empire waist, adding to the laid back hippie-chic vibe. The open back has a tie closure to complete the dress. This dress would be perfect to wear to a summer concert or festival. Pair this dress with a cute pair of wedges and statement earrings to complete your look! Details: Lind until mid-thigh. Adjustable spaghetti straps. 100% polyester. Dry clean only. Small measurements: Length from top of bust to hemline: 49”. Bust: 32”. You have added Lotus Embroidered Open Back Maxi Dress in Coral Red into Wishlist. You have added Lotus Embroidered Open Back Maxi Dress in Coral Red for Stock Notification. You have set Lotus Embroidered Open Back Maxi Dress in Coral Red as a loved product. 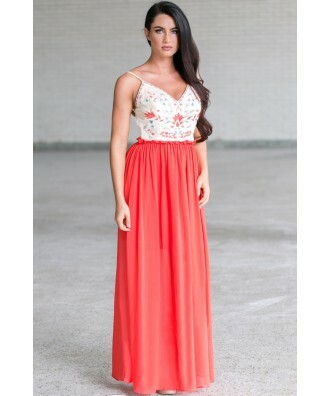 You have removed Lotus Embroidered Open Back Maxi Dress in Coral Red as a loved product.